The discussion of the seven seals begins in Revelation chapter 6. Remember from my introduction, that Revelation is symbolic of actual events. Therefore, each “seal” is a perioid of time when significant events in history occurred. With this in mind, let’s dive into the first seal. 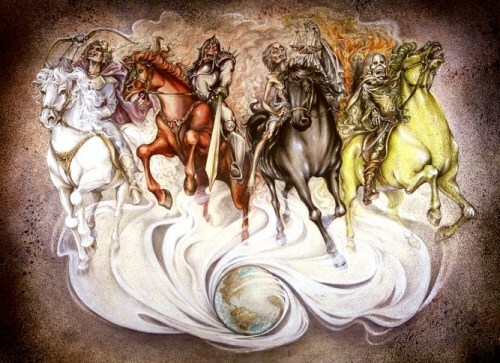 The Four Horsemen. Art used by Pat Marvenko Smith, copyright 1992. The first seal represents the golden era of the Roman Empire. The Roman Empire was established when Julius Caesar Augustus defeated Egypt in the Battle of Actium on September 2, 31 B.C. Augustus was later crowned the first emperor of Rome on January 16, 27 B.C.. The emperor after Augustus was Tiberius who reigned during the life of Jesus and is mentioned in Luke 3:1. For the next several hundred years, Rome rapidly expanded its empire reaching Asia and Africa. It enjoyed power and wealth as new roads, towns, and cities were built. However, over time, this power began to corrupt Rome, and its emperors went from bad to worse. This brings us to the next seal. The second seal represents the fall of the Roman empire. From 193-284 A.D., the Roman empire began to decline due to poor leadership. This began with emperor Septimius Severus who turned Rome into a military dictatorship. He replaced the imperial guard with 50,000 of his own men. He also ordered the executions of many Roman Senators on charges of corruption and conspiracy against him, again replacing them with his own men. Severus also persecuted Christians, along with Maximinus Thrax, Decius, and Valerian during this period.